hink you’ve gotten all of the surprising Star Wars news you can handle this year? Well brace yourself for more! Diamond Select Toys will offer an exclusive variant of their vinyl Jawa bank at C2E2, the Chicago Comic and Entertainment Expo, this weekend! That’s right, only 250 have been made, and they’re all in Chicago right now! 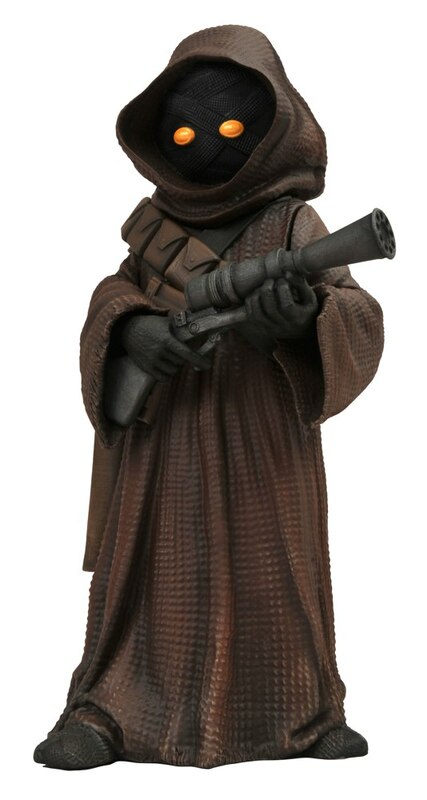 The variants which costs $22, depicts the 1/4 scale Jawa holding an ion blaster, instead of the regular edition’s restraining bolt caller. As used by the Jawas in Star Wars Episode IV: A New Hope, the ionization blaster fires a bolt that disrupted electrical systems, temporarily shutting down droids which they would then claim under Tatooine salvage laws. Only 250 of this vinyl bank were made, so get to C2E2 ASAP, or find someone who’s already there to pick one up for you!